Here’s how I made these American Horror Story costumes. I have a strange addiction to American Horror Story. After re-watching season 3 (coven) about 1000 times I realized my theme would be centered from this. I didn’t want to do drag (as the majority of the cast is female) and I didn’t wanna walk around explain who I was. I should also mention my partner and I wanted a “couples” costume. After googling ti’ll my fingers bled I could only find crappy typical ideas. Back to AHS coven. My favorite character was Marie Laveau the voodoo queen. So I thought she must have a king. And every good king needs a voodoo doll. I began with gathering supplies from the forest across my street. I was grabbing twigs bark moss and anything that had fallen to the ground. I constructed a chest plate of straw twigs from the forest and dollar store bones. A cheap coat from Sally Anne that was distressed and tattered. I bought a staff from spirit which I wrapped in bark and twine. Added 2 more skulls to the reverse side and added some shrunken head barbie doll heads. I even added mini potion jars to the staff just in case I needed to cast a spell throughout the night. I bought a plain black top hat and decorated it with straw rope, playing cards, dollar store bones and a crow-small head which I also found at the dollar store and fabricated. For the doll I bought a head to toe jump suit which I covered with burlap. 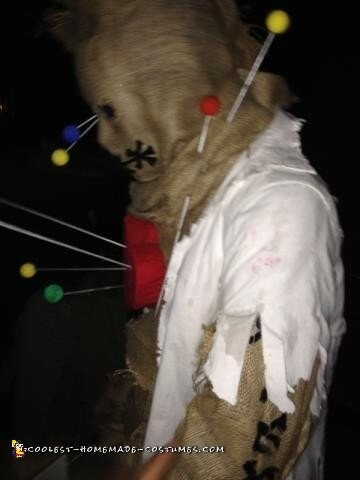 The pins are made from cooking skewers and foam balls. His hands were made completely with burlap (an amazingly easy fabric to use that hot glue sticks to like cement). I even burlaped a pair of high top sneakers for my doll. This is the first time I fabricated a costume from the floor up. I was actually shocked myself with how amazing our American Horror Story costumes turned out. We won 2 Halloween costume contests and heard nothing but praise about how amazing our costumes were. I never felt like more of an artist then when I saw the look on people’s faces enjoying every little detail I had put in. 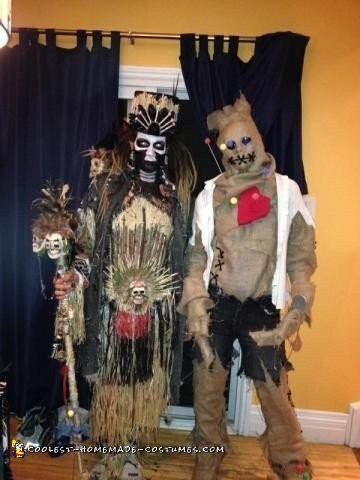 Even if I don’t win this prize I know that these costumes will go down in history as best Voodoo DIY costumes ever!